Welcome to PBI Sprockets.com. We invite you to browse through our store and shop with confidence. You can create an account with us if you like, or shop as a guest. Either way, your shopping cart will be active until you leave the store. Shipping is now available to 22 countries. UPS and USPS shipping in the US, all other countries are shipped USPS. Questions call 800-628-1256 7am-4pm M-F, Pacific time, Hillsboro, Oregon. 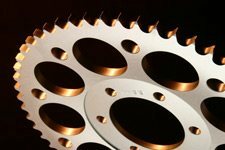 Offset engine sprockets for Honda, Kawasaki, Suzuki, Yamaha. Available in 1/4", 3/8" and 5/8" offsets. Mini and Micro Sprint Cars, 520 Chain.